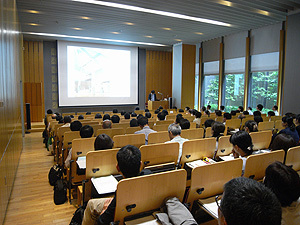 This follow-up training session (the first for three years) was held on July 6, 2015, with the aim of helping to disseminate the latest knowledge in the field of materials conservation, aimed mainly at people who have already completed the “Training for Museum Curators in Charge of Conservation” training program; a total of 107 people attended the session. With the coming into effect of the Minamata Convention on Mercury, under the terms of which restrictions will be imposed on the use of mercury and products containing mercury from 2020 onwards, production of certain types of fluorescent lamp will cease, and there will be a reduction in the quantity of incandescent light bulbs produced; as a result, switching over to the use of white LED lights for display lighting will no longer be optional and will in effect become “compulsory.” Following an overview of the Minamata Convention on Mercury (given by Chie Sano, Deputy Director of the Center for Conservation Science and Restoration Techniques), Naoto Yoshida outlined the current situation regarding the development of white LED lights. Kyoko Kubo of the Society for Preservation of Japanese Art Swords, Yusuke Kawase of the National Museum of Western Art, and Takako Yamaguchi of the Tokyo Metropolitan Museum of Photography were then invited to talk about the effectiveness of white LED lights as display lighting for Japanese swords, oil paintings and sculptures, and photographs, as well as the types of problems that have been experienced so far. Yamaguchi also discussed the impact that the Minamata Convention will have on daguerreotypes (a photographic technique that required the use of mercury). There is still considerable uncertainty as to how things will develop in the future in regard to the production of the fluorescent lamps and halogen lamps that have been used up until the present to provide the extremely high color rendering performance needed for display lighting; more work needs to be done in this area in terms of the collection and presentation of relevant information. It was also made clear from the talks given at the training session that there is a real need for clarification, from a natural sciences perspective, of the reasons why objects look different when viewed under LED light (compared to how they appear when viewed under conventional lighting), despite the fact that, statistically speaking, LED lights should in theory possess adequate color rendering performance.